Hungry again, we went to The Plantation Bar & Bistro. This was how we spent celebrating the 2nd part of my mother’s day. We ordered Carbonara Linguine, Shrimp Pesto, Seafood Putanesca, and bottomless iced tea. The pastas’ taste were great. 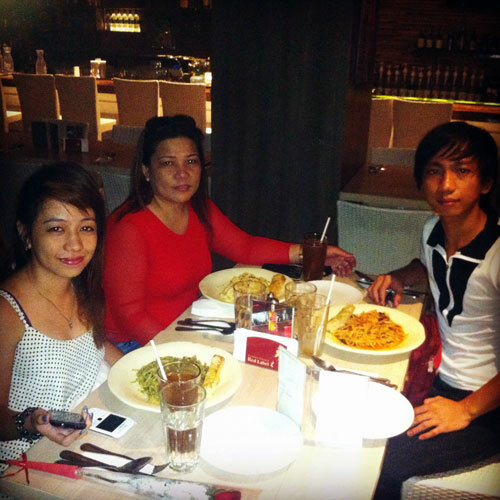 My mother and I like Seafood Putanesca the most while my sister enjoyed her Shrimp Pesto. Our stomach got full again. It was the first time we celebrated mother’s day like this. We were happy today and thankful that we have such a good life. This entry was posted in Food Corner, People & Events and tagged bonding, celebration, family, food, pasta. Bookmark the permalink.